12 Palestinians have been killed and dozens wounded as 30,000 gather on the Gaza-Israel Border for peaceful demonstrations for the ‘March of Return’ running for six weeks. 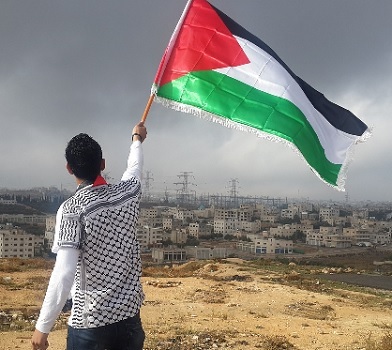 May marks the 70th anniversary of the founding Israel and what the Palestinians call ‘Nakba Day’ – the day of catastrophe, when three quarters of a million Palestinians were expelled and forced to flee their homes, becoming lifetime refugees. 250,000 of those uprooted flooded into Gaza. The sense in Israel is that this is what the leaders have always most feared: ‘The marching of uprooted Palestinian refugees on Israel.’ Although intended to be peaceful, the risk of escalation is high; and Trump’s crass decision to declare Jerusalem capital of Israel has only exacerbated an impossible situation where the Palestinians have nothing to lose. 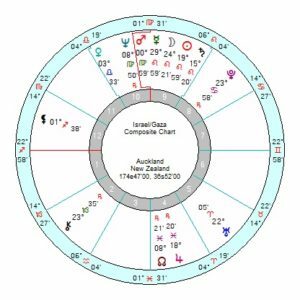 The Israel chart does look on high alert with tr Uranus moving to trine the Mars in Leo from April 12th till late month and returning into early 2019. Uranus Mars is explosive, overly-excitable with rash decisions likely. The Solar Arc Saturn is also conjunct the Israel Ascendant bringing a sombre mood and with Solar Arc Pluto following so there will be a bleak obstinacy prevailing in the years after. 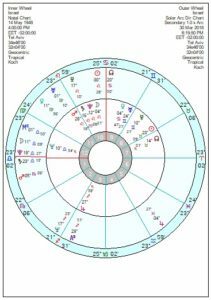 Tr Uranus opposing the Mars/Jupiter midpoint until mid April will bring hasty decisions, maybe not wise ones; with pushy confidence in June though confusions and uncertainty after that. The Gaza, 9 November 1917 9am, chart, looks enlivened by the idea of the demonstrations, though also uncertain and fearful, with setbacks in April; shocks in July and disappointments. The next three years look, even in their terms very tough, with tr Pluto square the Saturn/Node in 2019/2020 and opposing Saturn/Pluto in 2020/2021. The relationship chart with Israel gets a severe jolt from late April, worsening mid May and those influences return into early 2019. Israel has walked itself up a cul-de-sac from which there is no exit. Most Israelis you talk to think there is no solution to the problem. And the Palestinians will continue to pay the price. A fascinating article on the refugees, well worth reading. Alex, You’re right. But I doubt it’s going to happen. I’ve just noticed Israel’s MC is conjunct Procyon, which is associated with a fast rise to success followed by a plummeting downfall. Tr Pluto will square their MC in 2021/2022. And tr Pluto moving into Aquarius from 2024 will starr to haul across in opposition to their 10th house Moon, then later Saturn, Pluto and into the 2030s square the Sun and oppose Mars – so the pressures for change will be enormous. israel should be treated as apartheid South Africa was treated. They should know the opprobrium and disgust of the West so eventually change might come as it did in SA. Otherwise our governments are party to ethnic cleansing, land theft, and daily brutality. A massive and festering injustice. The problem with the Labour Party and their ilk is they have allowed their justified dislike of successive Israeli governments’ policies on the Palestinians to widen out to include all manner of offensive nonsense – Holocaust denial, Mossad bringing down the Twin Towers, Jewish money men ruling the world etc etc. And that damages their cause. Netanyahu is as guilty as anyone of using anti-Semitism as an excuse for deflecting accusations of brutality and inhumane treatment. My answer is always quite simple if I’m accused of anti-Semitism – I find it gratuitously insulting as well as being bullying and manipulative. That usually shuts people up. One additional problem for the Labour Party is that they have traditionally supported freedom fighters and the Palestinians have every reason to hate the Israelis – as Moshe Dayan accepted – so Corbyn will have sat on platforms where very inflammatory language is being used. The Palestine issue is a standing international obscenity. There should have been multi-national policing put in at the time to ensure the rights of the indigenous people were not affected. But after World War 11 the focus was elsewhere. And this far down the road, I really don’t see where the solution lies. It’s a deliberate policy I think to conflate anti semitism with anti Israel sentiment. The anti semitism in UK Labour Party, and elsewhere , pales into insignificance compared to the brutality meted out to the Palestinians every day of the year. Never a peep about that on the corporate media. I am 60 now and this sad conflict has been happening as long as I could consciously think about the world, in other words I cannot remember a time it was not there and surely if the people of Israel are the talented, creative people they say they are, they should have sorted this by now. Israel can do what it likes as there is no sanction against them. They are in breach of more U.N. resolutions than the rest of the world put together, abetted by the US, UK and, these days, corrupt Sunni Arab kingdoms in the ME. The world should treat Israel in the same way it treated its moral bedfellows South Africa in the bad old days, with isolation and boycott, IMO. Absolutely right Alex. . No-one dare criticize Israel or its policies for fear of being called anti-Semitic. The people of Palestine are held in an area no larger than the town of Leicester and the only “weapons” they have against Israel’s guns are stones. Most are under 20 as the life-expectancy is minimal.